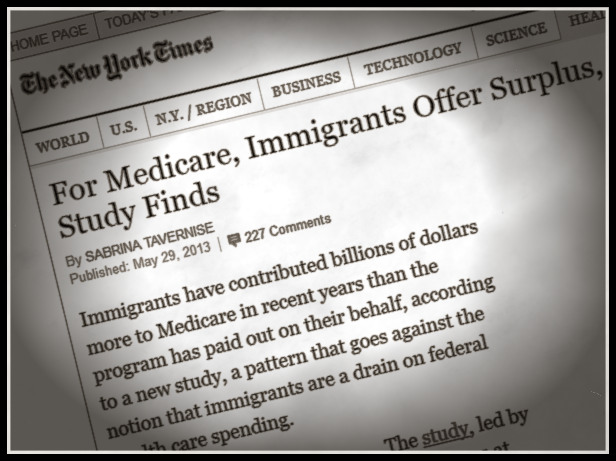 This morning's New York Times carries another one of those stories on biased academic studies that suggest that immigrants financially help support federal programs, in this case Medicare. It is one of those studies where the numbers quoted are probably accurate, but they are totally misleading. In this one, a clutch of Harvard researchers concludes that "immigrants may be disproportionately subsidizing the Medicare Trust Fund", thus dismissing other studies, such as that of the Heritage Foundation, that indicate that over their lifetime immigrants pay far fewer taxes than their use of tax resources. The full Harvard study can be seen here. The problem is a simple one. The Harvard study looks at Medicare contributions and costs in a short time space, 2002-2009, comparing two populations: the foreign-born and the U.S.-born. By definition, the U.S.-born population includes people of all ages, from infants to those over 100, and it is spread out among Medicare users and Medicare payers. But the foreign-born population clusters in a narrower age range, with fewer infants but also fewer elderly, since younger, working-age people are much more likely to migrate than older ones. In other words, a much smaller share of the foreign-born are over 65 than of the native-born. So of course, as even the authors admit, the immigrants are more likely in such a snapshot to pay more Medicare taxes than use Medicare services. What the Harvard study failed to do was to compare like populations; i.e., apples to apples. Immigrants get old, too, but if you use a snapshot (of 2009, for example, or any single year) you will always find that immigrants make up a smaller share of the elderly than of the overall population, and thus will have a different tax-cost balance. Is Harvard going to conduct a study showing us that high school students are younger than college students? Probably not, because it could not be used to tilt any public policy debate, as the current Medicare study apparently seeks to do. The problems with the latest study are identical with those in the comparable "study" issued by the Social Security Administration through the office of Sen. Marco Rubio (R-Fla.). That document showed that if you take a snapshot of the situation you will find that immigrants pay more into the Social Security Trust Fund than they take out, as discussed in this CIS report. The SSA's tabulations did not touch on the life-long balance of Social Security costs of natives and immigrants, just the short-term balances, which are heavily influenced by the relative youth of the adult migrants. The mas-migration people must think that there is a specialized fountain of youth out there that only influences the foreign-born and not the rest of us.